Although my initial presentation time was shortened due to a large-list of speakers of the event, in which, I’ve mainly focused on the Universal Declaration of Human Rights (UDHR) #Article19, Freedom of Expression. A combination of the concept of SECULARISM along with the Article#19 at large is presented as the SOLUTION to the several decades over-due all global ongoing problems. However, this one of the most important two elements is missing in the United Nations’ 2030 Agenda, more specifically, the Sustainable Development Goals (SDGs). Without including and implementing these as the backbone and integral part of the SDGS along with achieving PEACE & SECURITY for girls and women on the global level, in this context, we may not be able to achieve these noble goals by 2030 even by 2050! This was my way of introducing the core vision of The Light Millennium in connection with the International Day of Peace and in support of the Right to Peace theme. Through these articles of the UDHR, also an emphasis to “Access to Information”, is underlined as the missing link in the United Nations’ 2030 Agenda. Because, there is nothing in it as a main goal or sub-targets to that of Article#19, in more generic terms, Freedom of Expression. This has not been included in the Sustainable Development Goals. Specifically, in connection with a set of HUMAN Development related GOALS such as SDG#1, 2, 3, 4, 5, 6, 7 and onward… Also, the Article#19 was not included in the Eight Millennium Development Goals during the 2000 – 2015 period. Thus, can we really achieve the UN’s 2030 Agenda without freedom of expression (hate speeches and all forms of promotion of hate are excluded)? Without SECULARISM as the backbone of the world’s political structure and governance? Even including Article#19 in alone one of the SDGs as sub-target or let’s imagine it as Goal#18, even this won’t be sufficient towards the solution in today’s world problems unless SECULARISM also is its like a skin-and-bond. Clearly, both needs and must to be as an integral part of the each and all the SDGs, in particular, in its all “Global Security, Peace, and Human Development” related goals and sub-targets. To take up this idea further, without including Article#19 as the backbone of the achieving the SDGs by 2030, and without given any sufficient attention and place in any discussion at the UN Premises on the Article#19 at large (not limited with World Press Freedom Day – May 3), and on the SECULARISM, which both rarely come up even as a question from the floor during the UN’s any given regular sessions. This may be a strong indication that we may not be able to make a drastic progress towards the 2030 Agenda as long as we are leaving out these two key points. It is very obvious that ‘we do have a problem and the solution’ as long as we channel all our resources and energy and time on the global level towards the solution, only then we have a chance towards the Culture of Peace on the global level. In reference to the presentation’s full title, and as in an abstract form to ongoing wars, conflicts, hunger, inequality in education on the global level, in health, diseases, gender inequality, child marriage, equal right to quality education, clean water, energy, life on land, life underwater, and each of them is interconnected, in particular, with the human development related Goals and SDG#16: Peace and Justice Strong Institutions. “Article 20 of Japan’s constitution, written in 1946, states the following: “Freedom of religion is guaranteed to all. No religious organization shall receive any privileges from the State, nor exercise any political authority. 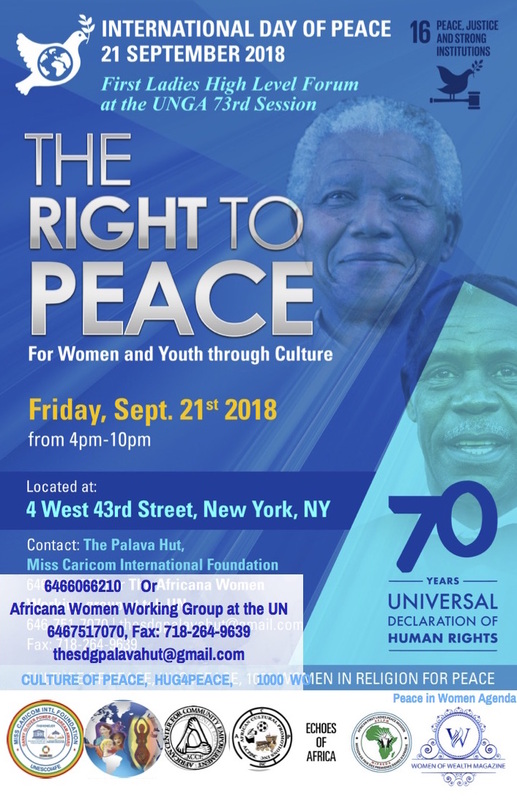 As it is introduced in the beginning, the event dedicated to the RIGHT TO PEACE: Women & Youth through Culture and the International Day of Peace (September 21) themes along with in support of the SDG#16. 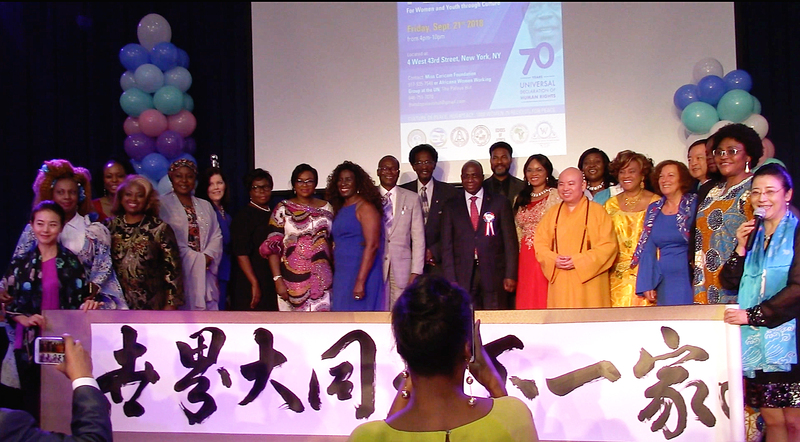 The event was organized by Africana Women Working Group at the UN and Miss Caricom International Foundation and convened by Dr. Ada Okika and Dr. Monica Sanchez. Africana Women Working Group at the UN has since its inception in 2011 focused on the UNGA Agenda for women and girls. The working group is a networking of women and women-focused organizations. It has addressed pertinent concerns on women and girls along the UN agenda for women. 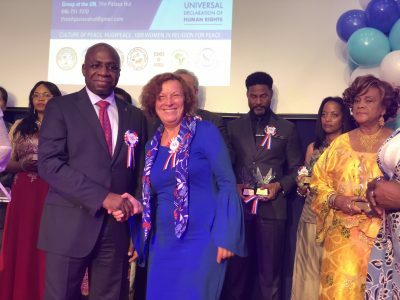 Africana Women Working Group at the UN has attracted many first ladies to its High-Level Forum at the UN General Assembly each including the wife of the former Secretary General of the United Nations, Mrs. Ban Ki Moon. Africana Women Working Group launched the My Sisters’ Health Watch at the UN with the support of the President of UNGA70 Session, UN Missions, UNFPA, UN Women, Every Woman Every Child, WHO and African Union Observer Mission to the UN. Special Thanks to Nusret Ozgül, for his support for the initial research on Turkey. – Posted on September 24, 2018.